A pair of Assassin’s Creed sidescrollers set in 19th century India and early 20th century Russia will be released on January 12 and February 9, respectively, according to a Ubisoft press release, months after the publisher had all but stopped talking about them. The games, Assassin’s Creed Chronicles India and Assassin’s Creed Chronicles Russia, will complete a trilogy started by last April’s so-so sidescroller Assasssin’s Creed Chronicles: China. That game was light on story and focused on translating the series’ trademark hiding and killing for 2D gameplay. All three games are developed by Climax Studios. ACC: China had been announced in 2014 as part of Assassin’s Creed Unity’s ill-fated season pass and was re-introduced in early 2015 as the start of a globe-hopping trilogy, with India and Russia to follow. But Ubisoft soon shifted to focusing only on promoting the overall series’ next major release, November’s Assassin’s Creed Syndicate, giving only occasional assurance that India and Russia were still coming. Fans discovered a trophy list for India in September, fueling assumptions that that game was ready for launch. Both new games will sell for $10 and will be available for Xbox One, PS4 and PC. The trilogy will also all be released for Sony’s Vita handheld on April 5. 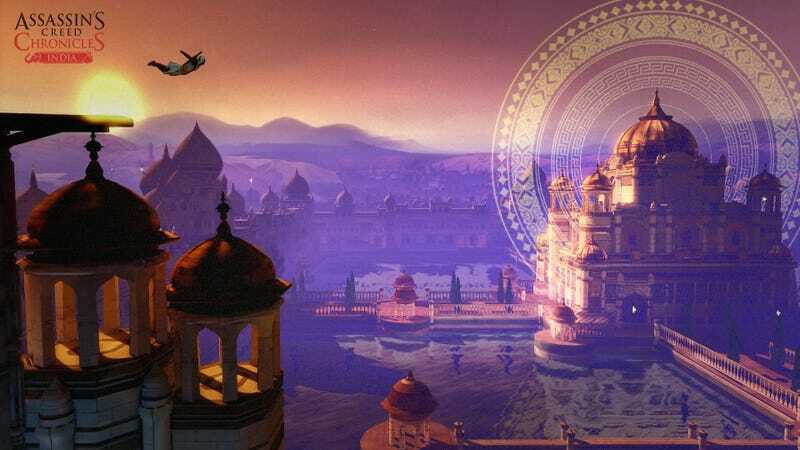 Ubisoft has shown that the next two games are designed to have some artistic flair, India looking a little more painted, and Russia drawing inspirationfrom period-specific poster art.